Dear Reader: My apologies. As Cecil might say, we’ve been fighting ignorance since 1974, and it’s taking longer than we thought. My hopes to retire this post have not been realized. Heck, it doesn’t even need much editing from past years. Saints save us, please! 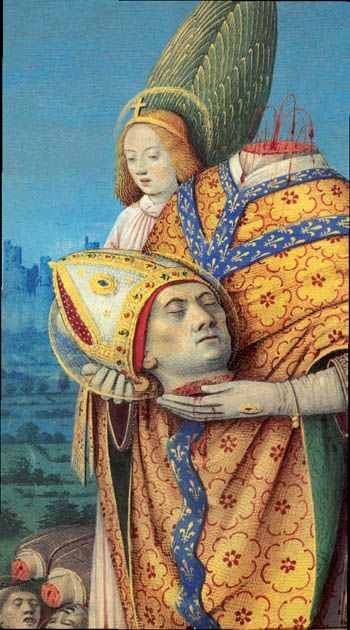 A later painting of the martyring of St. Denis. Though I can find a couple copies of this painting, neither lists who was the painter, nor where the painting is. Clearly, he is the guy to pray to about Donald Trump, Ben Carson, Rush Limbaugh, Todd Akin, Paul Ryan, intelligent design, and the Texas State Board of Education, no? 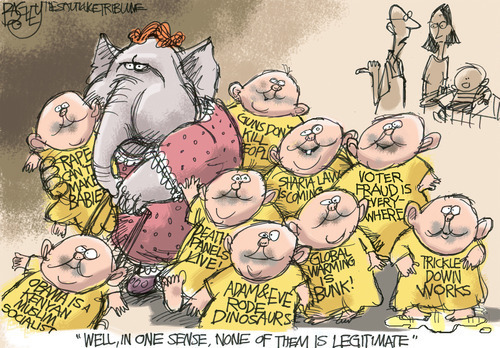 In 2013, we added Ted Cruz, Mike Lee, Louis Gohmert, the entire Tea Party, and the entire GOP crew of the House of Representatives. You catch my drift. In 2018 we could add a raft of people: Marsha Blackburn, Ryan Zinke, Sid Miller, Denny Marchant, Jeff Sessions, Sarah Sanders, Mitch McConnell, Lindsey Graham. We’ve left 253 Republicans off for lack of space. As I wandered the hall Tuesday night, past cowboy hats and cheeseheads, I ran into Christopher Shays, a delegate and former congressman. I asked the Connecticut moderate if he felt lonely at the conservative masquerade ball.